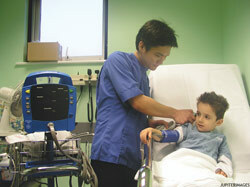 The ‘At the hospital’ role-play kit is accessible and easy to use. There are four practical activities dealing with different aspects and areas of a hospital. Each activity aims to develop understanding and learning, as well as to develop a child’s confidence, memory and empathy skills. Basic speaking and listening skills are developed through many of the activities, as the children are encouraged to speak clearly and with confidence, as well as to listen and respond to the performance of others. The nature of the role-play kit also means that the children are taught to interact and work well in groups, and to discuss ideas together when planning short sketches. The children should all be encouraged to contribute and to listen to each other when working in groups. The activities require very little preparation and are easy to integrate into current planning. In the most demanding cases, you may need a bigger space. They can be supported by the images on the accompanying ‘At the hosptial’ poster, and the activity sheet resources (see attached rssources below). Each of the role-play scenarios can be enhanced and extended by using the interactive whiteboard poster, enabling the children to experience the sights and sounds – inside and outside – of a hospital. The following four activities are designed to be flexible and many can be easily adapted to suit different age and ability ranges. The ‘Differentiation’ section in each activity gives some guidance on how you can support less able children and stretch more able children. You will need: ‘At the hospital’ activity sheet; safe, open space; whiteboard or flipchart; pens. What’s in the first aid kit?